Feedback to your editorial SindhiShaan (July to September) about two issues i.e. preservation of SINDHYAT and need for a State. SINDHYAT will remain alive if we Sindhi's are alive to our History and also to the Geography of Sindh and feel pride for our own culture. By cultural I do not mean only Sangeet and Sahatiya but Hindu culture as our SINDHYAT has its own flavour in Hindu culture i.e. our nature of Sufi-ism i.e. live and let live, which has affected even the Arabic and Islamic culture and also the materialism of Western Countries. By our SINDHYAT we have endeared ourselves in every corner of the World, wherever we live. But our SINDHYAT is to be augmented by Political Power of Bharat. If Bharat is weak we cannot expect any respect for our Cultural anywhere. WE will live only as migrant community (Gumantu Jaati). So, let us make Bharat strong by rising over the communal feelings. We should feel proud of being Hindus (Indians First and Sindhi's Next) we should be honest and fair in our commercial as well as social dealings, we should be true Hindus – Sufi-ism been part of Hindu philosophy. We should study Sanskrit literature which contains treasure of Hindu culture and the lives of Saints & Rishis and follow in the foot prints of their lives. Second problem is the need for a separate State. We should shun the idea of demanding a piece of land from the Central Government. Which part of India will accept our demand. Even the citizens of Kutchh whose language and culture is akin to ours will not agree to lose their identity as Kachhi's or Gujaraties. Any idea on our part of creating Sindh in India will create problems in the shape of strife between the locals and our community. We already suffer from the bad will of the locals, due to their jealousy in trade, education, philanthropic matters. We have the creative nature of turning Earth into Gold by the dint of our intelligence and hard work. So let us always think that we should regain our lost territory of Sindh. It is unfortunate the leaders of our community of 1947 didn't try to agitate and had no idea of getting Tharparkar District of Sindh where the Hindus were in majority to be retained Bharat. We were amuck by the decision of the partition of the country which we had never thought of and all our time and energy was spent in seeing that Sindhi-Hindus migrate peacefully form Sindh and settled in India without much loss of life and property. But now is the time when many of Sindhi-Muslims have realized that the partition of the country was a great folly. They take pride in the culture and History of Moan-Jo-Daro, Harappa and Taksh-shilla. Let us try to create an atmosphere of confederation of the two countries India and Pakistan for preservation of our ancient culture and the treasure of knowledge. When two Germanies can re-unite after partition and the Israellies can re-gain their lost territory even after two thousand years wandering and suffering atrocities and refused shelter by almost all the countries excepting India. Their pecularity was that they passed on the Sankalpa of regaining the territory from generation to generation on every social and religions occasion. We also should try and hope that the day will come when our beloved Sindhu-Nadi shall form the part of India. 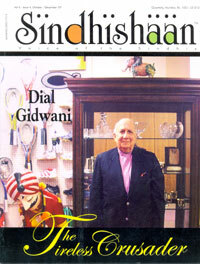 Shri Bhagwan Gidwani (Page No. 30 of SindhiShaan) has rightly called us as a nation and has advised Sindhi-Hindus-Muslims who are outside Pakistan to unite for the emancipation of Sindh which has age old heritage of equal respect for all faiths and its message of peace, prosperity and goodwill amongst all people of the world. Till the emancipation of Sindh we Sindhi's living in India should continue to fight for our political rights as advised by Shri Ram Jawhrani (Page 52 of SindhiShaan) to have the status of landless Sindhi Sate represented in Parliament by certain seats reserved for Sindhi community filled by nomination as in the case of Anglo Indian community. This requires an amendment in the constitution of India. A part from that we Sindhi's in India should take active part in Politics by contesting election on the tickets of any political party excepting such parties which have members of extra territorial loyalties and believe in muscle and money power.